In the last months, we continued our quest for a successor of the Sennheiser HDA 200 headphones. For our task, we needed headphones with a flat frequency response, and even more important, good passive attenuation. Most consumer headphones fail in this regard, and that left us with either clinical headphones with custom caps or anything we could get based on Peltor caps. The first question was about loudness, left-right transducer similarity and general spectral flatness of the headphones relative to the reference HDA 200 headphones. We measured a maximum-volume sweep coming out of a RME Hammerfall DSP Multiface II soundcard (yes, that is very loud) on the flat plate of a Brüel & Kjær artificial ear 4153. After this step, we decided to throw out the TDH 39 (not enough passive attenuation) and the Peltor listen-only headset (too quiet). 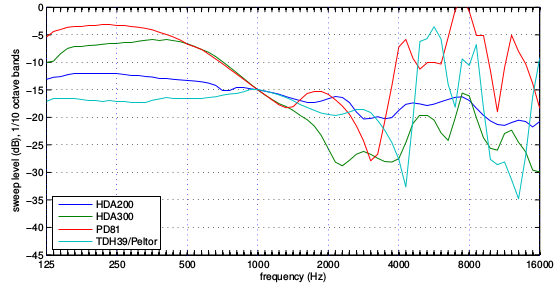 A second measurement with a more reasonable 100 dBpeSPL sweep on the same setup was done to get some good idea of the spectral flatness of the headphones. The following plot has the curves lined up at 1 kHz. Based on these results, we went ahead with the TDH 39 in Peltor caps. 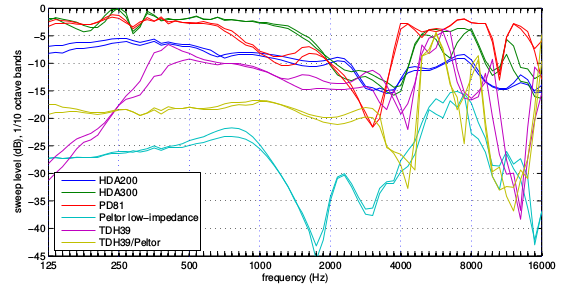 While sweeps are nice stimuli to characterize the headphones, we actually want to use the headphones for speech-in-noise tests with tablet computers. So in another test, we compared the maximum sound pressure level of the speech noise for the TDH 39 in Peltor caps and the HDA 200 connected to a tablet computer. 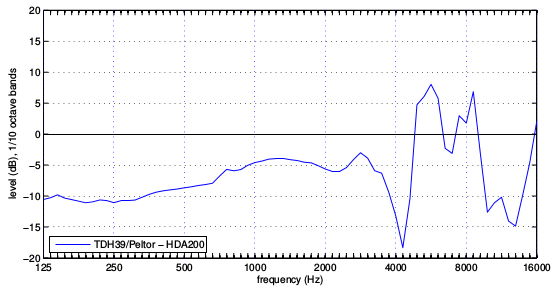 Besides the resonance peak, the TDH 39 in Peltor caps showed a general attenuation of about 5 to 10 dB relative to the HDA 200, which was still acceptable for our task. Additonally, we compared the performance of the TDH 39 and the DD45 as they both fulfill the same international standards. Independent of the measurement method, both transducers performed similarly. Finally, we performed some behavioral speech-in-noise testing at 65 dBSPL on a small normal-hearing group of 18 ears (a.k.a. testing the lab). No significant difference was found between the two headphone types. 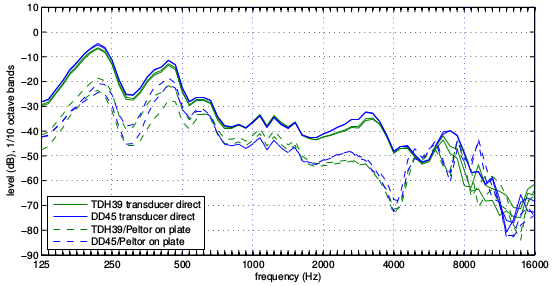 From all tested headphones with high passive attenuation, both the TDH 39 and DD45 in Peltor caps fulfill the requirements for loudness and spectral flatness. While they are normally only used for pure tone audiometry, behavioral speech-in-noise tests resulted in similar results as for the HDA 200. How much ambient noise attenuation does the DD-45 offer?